This article is excerpted from Sams Teach Yourself Android Application Development in 24 Hours (Amazon price at press time: $32.39), reprinted with permission of Sams Publishing. Coyright Lauren Darcey and Shane Conder, all rights reserved. Every platform technology uses different terminology to describe its application components. The three most important classes on the Android platform are Context, Activity and Intent. While there are other, more advanced, components developers can implement, these three components form the building blocks for each and every Android application. In this article, we focus on understanding how Android applications are put together. We also take a look at some handy utility classes that can help developers debug applications. An Android application is a collection of tasks, each of which is called an activity. Each activity within an application has a unique purpose and user interface. To understand this more fully, imagine a theoretical game application called Chippy's Revenge. Splash - This screen acts as a startup screen, with the game logo and version. It might also play some music. Menu - On this screen, a user can choose from among several options, including playing the game, viewing the scores, and reading the help text. Play - This screen is where game play actually takes place. Scores - This screen displays the highest scores for the game (including high scores from other players), providing players with a challenge to do better. Help - This screen displays instructions for how to play the game, including controls, goals, scoring methods, tips, and tricks. Starting to sound familiar? This is the prototypical design of just about any mobile application, game or otherwise, on any platform. Certainly, you are free to implement any kind of user interface you desire. There are no real user interface requirements on the Android platform, other than that the application must be stable, responsive and play nice with the rest of the Android system. That said, the best and most popular applications leverage the users' existing experience with user interfaces. It's best to improve upon those features, when necessary, rather than reinvent them, so you don't force the user to exert time and effort to learn your application in order to use it properly. SplashActivity - This activity serves as the default activity to launch. It simply displays a layout (maybe just a big graphic), plays music for several seconds and then launches MenuActivity. MenuActivity - This activity is pretty straightforward. Its layout has several buttons, each corresponding to a feature of the application. The onClick() handlers for each button trigger cause the associated activity to launch. 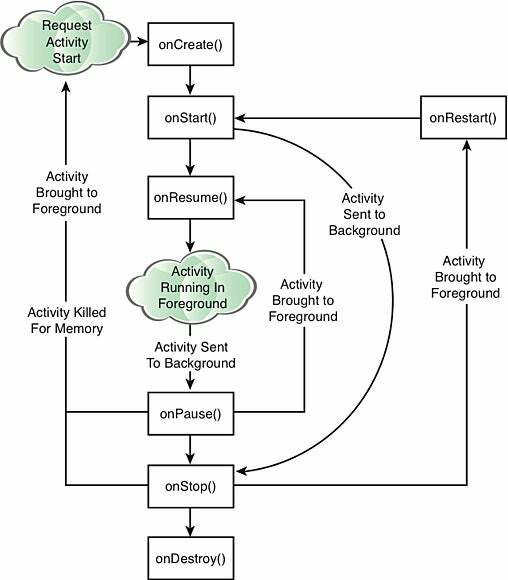 PlayActivity - The real application guts are implemented here. This activity needs to draw stuff onscreen, handle various types of user input, keep score and generally follow whatever game dynamics the developer wants to support. ScoresActivity - This activity is about as simple as SplashActivity. It does little more than load a bunch of scoring information into a TextView control within its layout. HelpActivity - This activity is almost identical to ScoresActivity, except that instead of displaying scores, it displays help text. Its TextView control might possibly scroll. Each activity class should have its own corresponding layout file stored in the application resources. You could use a single layout file for ScoresActivity and HelpActivity, but it's not necessary. If you did, though, you would simply create a single layout for both and set the image in the background and the text in the TextView control at runtime, instead of within the layout file. Design for game Chippy's Revenge Version 0.0.1 for Android. How do I control application state? How do I launch a specific activity? You might be tempted to just use your Activity context in all cases. Doing so can lead to memory leaks, though. The subtleties of why this happens are beyond the scope of this article, but there is a great official Android blog post on this topic. Once you have retrieved a valid application context, you can use it to access application-wide features and services. You can retrieve shared application preferences by using the getSharedPreferences() method of the application context. You can use the SharedPreferences class to save simple application data, such as configuration settings. Each SharedPreferences object can be given a name, allowing you to organize preferences into categories or store preferences all together in one large set. The first item on this list - launching Activity instances - is perhaps the most common reason you will use the application context. The Activity class is central to every Android application. Much of the time, you'll define and implement an activity for each screen in your application. 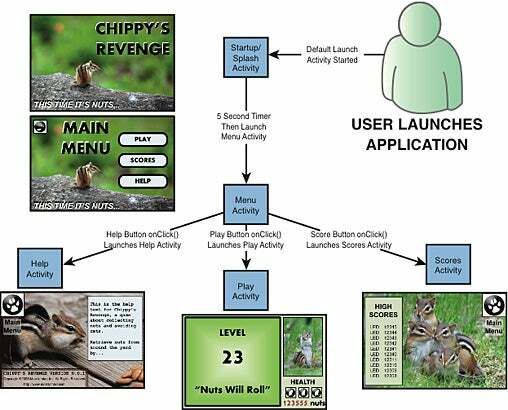 In the Chippy's Revenge game application, you have to implement five different Activity classes. In the course of playing the game, the user transitions from one activity to the next, interacting with the layout controls of each activity. Each Android application must designate a default activity within the Android manifest file. In the manifest file of a Droid1 project, DroidActivity might be designated as the default activity. Android applications are responsible for managing their state, as well as their memory, resources and data. The Android operating system may terminate an activity that has been paused, stopped or destroyed when memory is low. This means that any activity that is not in the foreground is subject to shutdown. In other words, an Android application must keep state and be ready to be interrupted and even shut down at any time. The Activity class has a number of callbacks that provide an opportunity for an activity to respond to events such as suspending and resuming. The table below lists the most important callback methods. Called when an activity starts or restarts. Initializes static activity data. Binds to data or resources required. Called when an activity becomes the foreground activity. Acquires exclusive resources. Starts any audio, video, or animations. Called when an activity leaves the foreground. Saves uncommitted data.Deactivates or releases exclusive resources. Called when an application is shutting down. Cleans up any static activity data. Releases any resources acquired. The image below shows the order in which activity callbacks are called.